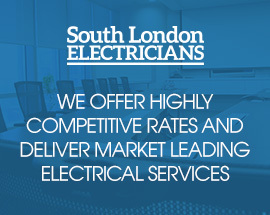 South London Electricians are a team of electrical experts based in Croydon. Together we are dedicated to offering the very best in electrical services throughout the South London and Home Counties area; which includes Hamsey Green, Clapham and Tooting. With over 23 years’ experience in the field, we believe that we have the right skills and knowledge to be able to solve a wide range of electrical issues, both big and small. It is this expertise that allows South London Electricians to help both domestic and commercial clients alike. The range of services that we offer are extremely wide and each and every one is always approached with the same level of dedication and customer focus. Before commencement of any work on your project, we are always happy to offer you a no obligation quotation on the task ahead giving you the opportunity to confirm that the expected priced will fall within your own budget confinements. Of course the ways that we can help are not just limited to these and as well as assisting in small residential jobs, including emergency call outs, we are able to facilitate large scale commercial installations such as warehouses and even restaurants. Additionally we can offer advice and guidance on your current electrical solutions including the ways that you can reduce your own carbon footprint by putting in place energy saving lighting. Having the right skills and understanding of the task in hand is a key part in our fantastic reputation; something that we work hard to maintain. To do this we always provide the best training for our staff, namely a City and Guilds qualification; which teaches them not only the relevant techniques to complete the work, but also awareness of the regulations that they must adhere to whilst doing it. Because of this, we know that once your project has been completed, you will be more than happy with the quality of service and of course the end result! Now you know a little bit more about us, why not find out what we can do for you. Call our 24/7 phone line on 07956 523316 and speak to one of our qualified electricians. We will discuss your requirements and implement a plan to solve your electrical needs. Each and every time!